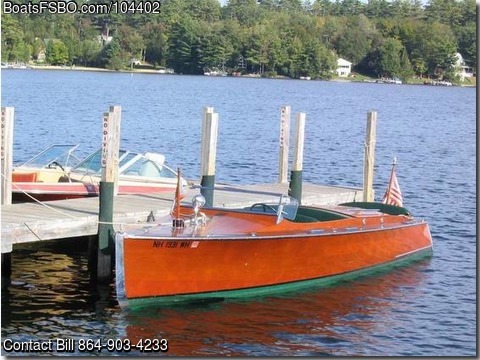 The boat is currently being shown by Irwin Marine in Lakeport (Laconia) NH.Beautiful Chriscraft runabout has been professionally maintained and stored indoors (winter) or under cover (summers). Original straight 8 Chrysler engine replaced in 1995 with a 275 hp V-8 engine. Work was done by Mark Mason of New England Boat & Motor. In 1998, a new double planked bottom was installed by Ivan Phelps with 3M marine sealant between the two layers. I bought the boat from Mike Whalley, a motorsports dealer and later NH Legislator. He had used the boat on Lake Winnipesaukee for a number of years. Since 1992, the boat has been in the water summers in a boathouse, and stored indoors by Irwin Marine for the balance of the year.